This is a comprehensive and flexible agreement for buying or selling any physical business assets in any condition. The type or types of asset being sold does not matter. The agreement suits deals where many assets are sold together in bulk and at the same time, and where the seller wants no "post-sale risk" and gives very limited warranties as to the condition. The buyer gets what he or she sees with only enough help from the seller to enable him or her to transport the items. The buyer and the seller could be any person, business or other organisation in any country. The contract provides legal protection to both sides with a set of fair terms. 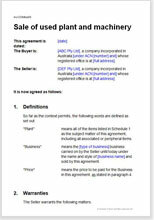 You can edit the document easily to suit your specific deal. Our guidance notes will tell you what you can edit safely, and what we advise leaving in place. When to use this document? Important to the suitability of use of the document is that the assets transferred are substantial in size or volume and require the seller to give help to the buyer to transport them (including abroad). If you are dealing with smaller assets, or intangibles, this agreement for the sale of assets may be more suitable. This contract is extremely comprehensive and written in plain English. It has been drawn for maximum flexibility and ease of use. allow you to construct commercial terms to suit your exact business needs. "Great website! Great range of legal documents, and outstanding supporting documentation. We have looked at many different options and netlawman.com.au have been able to provide a legal solution at a low price, effectively saving us $$$... Looking forward to seeing an Online Returns Policy"